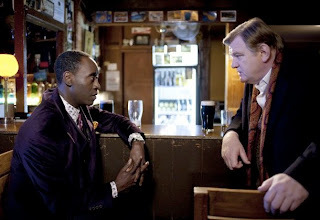 “I can’t tell if you’re really motherfucking dumb, or really motherfucking smart.” That’s how perpetually exasperated American FBI agent Wendell Everett (Don Cheadle) describes the whoring, drug-abusing and hilariously deadpan Irish Sgt. 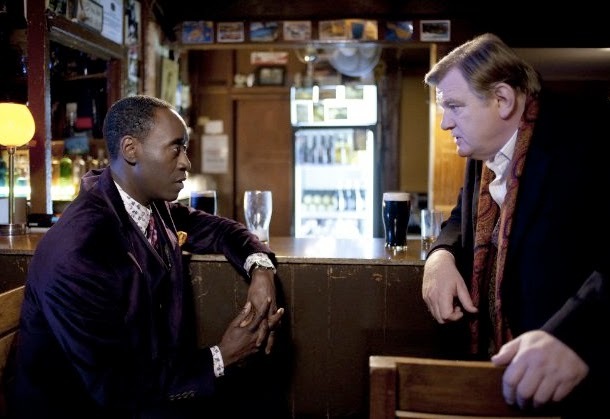 Gerry Boyle (Brendan Gleeson) in this appealingly offbeat and deliciously dark comedy. Everett has arrived in Boyle’s very unwelcoming County Galway, Ireland, on the trail of international drug smugglers. But "The Guard" is a lot smarter and a whole lot funnier than a typical fish-out-of-water buddy-cop flick. Although nowhere near as fast-paced or flashy, it’s more akin to Edgar Wright’s tongue-in-cheek "Hot Fuzz" than to anything that ever came out of Hollywood. Writer/director John Michael McDonagh is the brother of playwright Martin McDonagh, who wrote and directed 2008's brilliant "In Bruges" that starred Gleeson and Colin Farrell. Both McDonaghs share a talent for creating unique and fascinating characters who (as the saying goes) not only say funny things but say things funny. When Everett calls the casually insensitive Boyle racist for remarking that he thought all drug dealers were black, Boyle genially replies that racism is part of Ireland’s national culture. When Boyle expresses astonishment at learning that there are gay members of the IRA, a gun runner very reasonably explains that they were needed in order for the group to infiltrate MI-5. And Boyle’s utter lack of self-consciousness about discussing everything from smoking crack to scratching crabs is endlessly endearing. Excellent supporting characters include the intimidatingly badass Clive Cornell (Mark Strong), who refuses to help hide a dead body because his job description “didn’t include heavy lifting”; hitman Liam O’Leary (David Wilmot), who wants it known he is a sociopath but not a psychopath, even though he can’t recall the difference; Boyle’s terminally ill mother Eileen (Fionnula Flanagan), who still jokes about attending orgies; and a pair of genuinely happy hookers (Dominique McElligott and Sarah Greene). This is one of the most enjoyable films of the year.